Some people are attracted to every shade of blue. I happen to be a green girl. My dining room is in a sage green Schumacher wallpaper (read more about beautiful sage/sea foam rooms here) and has a sage and coral silk rug. I almost always break out my vintage Limoges and Wedgewood china (I have the Columbia pattern in — you guessed it — sage green) for formal brunches and teas, along with my crystal and my grandmother-in-law’s purple glassware. 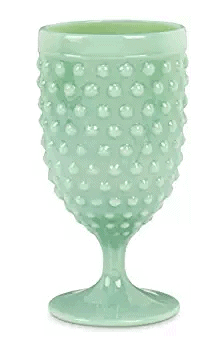 However, I saw these jadeite hobnail glasses this week and couldn’t get them out of my head! 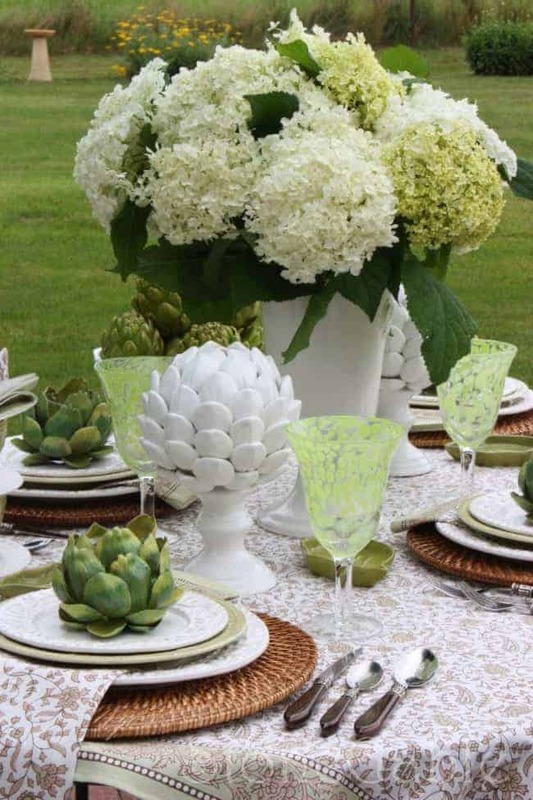 So, I decided to design an informal green and white tablescape — perfect for Spring, St. Patty’s Day, Easter, or whatever — without being too saccharine I hope. To that end, I varied my shades of green and added a little brown/tan/beige/natural texture to temper the sweetness factor. Of course, I’d want to use these goblets. I loved these adorable appetizer/bread dishes. These gorgeous (and inexpensive!) salad plates. Layered on these beautiful majolica dinner plates. These embroidered napkins are right up my outdoorsy-girl alley. And you can’t go wrong with a layered table cloth look. Love the block print — it’s on clearance!!! I own one of the burlap table cloths and always use it beneath my main cloth. It comes in various sizes, but I have the 120″ for my 60″ round table. If you miss out on the clearance block print table cloth, you can’t go wrong with buffalo check. 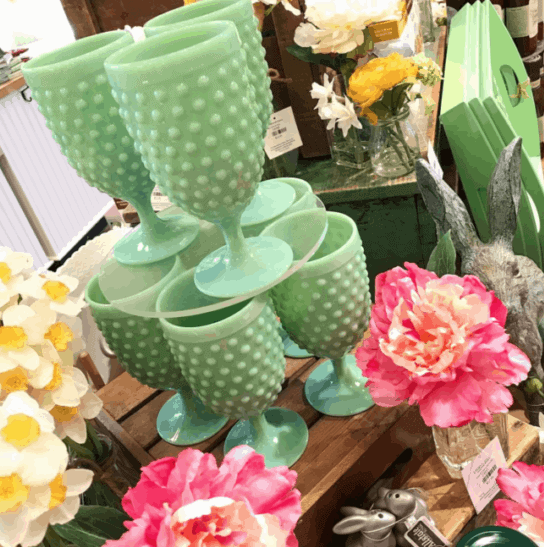 Finish it off with flowers and some fun artichoke candle holders! A graphic for your pinning pleasure! If you, like me, also really like vintage china and want to know about how to get whole sets at a really good price, you might like this post. Green and blue is one of my favorite color palettes. But if classic blue and white is really your jam, this dining room post may be up your alley. I’ll be back next Saturday with a way to stain proof your upholstery. Enjoy the rest of your weekend, and happy early Spring!